The lineup for the final match at the All Japan Championships was determined this afternoon, with both matches seeing come from behind victories. Mizutani has his eyes on a ninth national title. Five years after his brother won the title, Kazuhiro Yoshimura is in to the final of the Men’s Singles at the All Japan Championships. Yoshimura was able to come from behind to win his semi-final match against Kaii Yoshida. After losing the first game, Yoshida quickly went to a 3-1 lead. 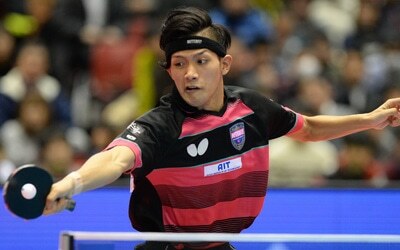 However, , as Yoshimura took the next three games 11-7, 11-7, 11-7. In the other half of the draw the semi-final stage provided a scare for Jun Mizutani. Mizutani had to come from two games down against Yuki Hirano to claw his way in to a 3-2 lead. The sixth game almost fell the way of Hirano when he pushed the defending champion to deuce. A seventh game wasn’t to be as Mizutani was able to rise to the occasion and take the game 13-11 to move in to the final. Will the name Yoshimura once again haunt Mizutani? Find out at 4pm local time when the final match of the All Japan Championships gets underway in the Tokyo Metropolitan Gymnasium.